Roundup's Purple Sage has been quite a producer. Three of his sons have placed 2nd in the Horn Showcase including, Sage's Reflection, who placed at the 2006 Horn Showcase. A daughter, Sage's Hope, placed 4th in 2006 and 2nd in the 2008 Horn Showcase. We have a small herd and for a bull to perform that well on just a handful of cows is the mark of a great bull. 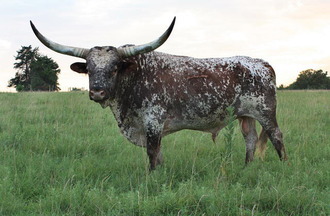 We have gotten great color, conformation, disposition, and horns from him. He crosses exceptionally well across the Overwhelmer/Senator/Gunman bloodlines.